Kaisika Ekadesi is said to be more important for Vaishnavites than even the Vaikunta Ekadesi festival. Kaisika Ekadesi is celebrated in the Tamil month of Karthigai and precedes Vaikunta Ekadesi. Those who undertake fast and sing and/ or listen to the Kaisika Puraanam on the Kaisika Ekadesi day, are said to attain Vaikuntam Moksham. Kaisika Puranam, which is a part of Varaaha Puraanam and comprises several hundred songs- all in small stanzas- shows Lord Narayana as the ultimate supreme force and is a case study in this modern money making world of keeping up one’s word at the cost of anything, even life. This year’s Kaisiki Ekadesi festival took place on Wednesday 21st November 2007. Thiru Kurungkudi is said to be the home to the Vaishnava tradition of ‘Kaisika Ekadesi’ and Kaisika Natakam (drama)- worship of the Lord through dance, music and drama is a special event at the Thiru Kurungudi Nambi temple on the Kaisika Ekadesi day- an event that dates back several hundred years. Kaisiki Natakam, which was performed in Thiru KurungKudi with great fanfare had been stopped in the middle of the last century. Only recently has it been revived thanks to the efforts of Anita Ratnam of the TVS family. This series on Divya Desam today takes a look at the history of Kaisika Ekadesi and the night long events that took place at the Srirangam Ranganatha Temple on 21st November 2007. ( Human beings typically give pigs the poorest treatment). In the Varaaha Avataaram, the Lord took the form of a pig and yet save the world. Paraasara Bhattar dissected the Kaisika Puraanam and created the vyakyaanam for the entire Kaisika Puraanam, which was hitherto non existent. Kaisika Puraanam is the story of a Chandala, a low caste person and his love for the Lord. Nambaaduvaan was a great devotee of ThiruKurungudi Nambi (a Divya Desam about 30 kms South East of Tirunelveli and near Nanguneri). But he was rather embarrassed to enter the temple during the day as he belonged to a lower caste (similar to TirupaanAzhvaar who felt shy to enter the Srirangam Ranganatha Temple). Nambaaduvan was a ‘Jaagrutha Vrathan’, one who comes out when all others are sleeping. Every night, he would walk several miles to the Thiru Kurungudi Nambi temple and for hours together, he would stand before the Lord Nambi with the Veena in his hand and sing praise of him. And before dawn, he would go back to his place, so no one noticed his presence at the temple. One night, as he was making his way to the temple, a Brahmma Raakshasha(a huge demon) stopped him and wanted Nambaaduvan for dinner, claiming he was quite hungry. Nambaaduvan requested Raakshasha to allow him to go to the temple for a night, so he could sing praise of the Lord one last time and that he would come back in the morning for the Raakshasha to consume him. The Raakshasha laughed out stating no one in this world would be foolish enough to let go a handy prey. Wanting to meet the Lord one last time, Nambaaduvan requested the Raakshasha several times. Hence, I promise to you that I will return. Nambaaduvan makes 18 promises that night to the Raakshasha and states that if he fails even in one of those 18 promises, he will be a party to 18 sins. The 18th promise of Nambaaduvan is the essence of the Kaisika Puraanam and the reason why Kaisika Ekadesi and Kaisika Puraanam are most important to a Vaishnavite, even more than the Vaikunta Ekadesi. This promise reinforces the belief that Lord Naarayana was the one and only supreme force in those days and that he is incomparable. Through these 18 promises narrated in the Kaisika Puraanam, as part of this discussion between Nambaaduvan and Brahmma Raakshasha, one comes to know of the different sins we commit every day in our lives as a result of not fulfilling some of the basic things we should do. This promise convinced the Raakshasha that Nambaaduvan would return and he let him go. Nambaaduvan then leaves the Raakshasha and walks to the ThiruKurungudi temple to sing praise of the Lord, for possibly the last time. He spends the entire night in front of the Thirukurungkudi Nambi and then makes his way back to the Raakshasha as promised. On the way, an old Brahmin stops Nambaaduvan and asks the reason for him rushing back, much in contrast to his usually slow and thoughtful walk. Nambaaduvan explains his situation to the Brahmin, who condemns him as a fool and offers protection from the Raakshasha. Nambaaduvan however rejects this offer stating that he has promised the Raakshasha that he would come back before dawn and that he has to return as quickly as possible. Stunned by his response, the Brahmin allows Nambaaduvan to continue on his journey. On seeing Nambaaduvan, the Rakshasha wondered as to how this man came back, despite being under the threat of being consumed. Even more to his surprise, Nambaaduvan came close to the Raakshasha and offered himself as his prey. By now, the Raakshasha had changed his mind. He did not want Nambaaduvan’s body anymore. Instead, he now asked for the fruits of all the praise that Nambaaduvan had secured through his visits to Lord Nambi every night. Nambaaduvan refused this at first saying he would give his body away as promised. The Raakshasha explains the reason for his Raakshasha status. He was a Brahmin in his previous birth. Due to his arrogance of considering himself as the all knowing, he committed many sins including not completing a Yaagam. Hence, he had to take the ugly form in this birth. The Raakshasha requested Nambaaduvan that he share with him at least that day’s praise so he could get Moksham and go to Vaikuntam. Finally, Nambaaduvan agreed and shared with him the ‘Kaisika’ songs, which he had sung that very night in front of Lord Nambi of ThiruKurungkudi, thus securing Vaikunta Moksham for the Raakshasha. It is believed that any one who recites/reads or listens to the Kaisika Puraanam will get Vaikunta Moksham in this birth. Wednesday evening (21st November 2007) was an action packed one at Srirangam Lord Ranganatha Swamy temple. After having come out once in the morning on a procession, Lord NamPerumal took his 2nd procession of the day starting from the Sanctum at sharp 830pm.Coming around the Sannidhi, he reached the Arjuna Mandapam via the Kili Mandapam by 9pm. Five Araiyars- Lakshmi Narayanan, Sampath, Ranganathan, Krishnan and teenager Madhavan of Srirangam enacted the story of the Kaisika Puraanam for 2 hours beginning 930pm. While one Araiyar would narrate the song, another would explain the meaning and one other Araiyar would enact the story through the Abhinayam, a unique art/dance performance with their hands and legs. It was a performance that kept the 1000 odd people who were present at the Arjuna Mandapam, inside the Ranganatha temple. Araiyar Sevai is a visual song and dance enactment of the ‘Paasurams’ that has been performed at the Vaishnava Divya Desams for over 1000 years. Araiyars (King of Music) are descendents of Nathamunigal, who is believed to have introduced the Araiyar Sevai. 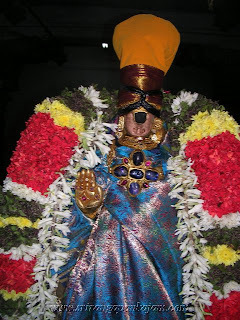 It is believed that Lord Ranganatha of Srirangam himself gave the Araiyars the right to perform the unique musical chanting at the temples and presented them with the cone-like red cap, two cymbals and the sacred garland (which they wear around their neck when they perform). While it is sad that Araiyar Sevai is now performed only in 3 Divya Desams in Tamil Nadu( its become a thing of the past in all other Divya Desams), this outstanding performance of the Araiyars in Srirangam including by the young boy (Madhavan), and the audience support that we saw here during the entire length of the Araiyar Sevai gives one hope that it can continue for a few generations yet. For 2 hours beginning 11.30pm on Wednesday night, the 62 year old Paraasara Azhagiya Singa Bhattar, a descendent of Paraasara Bhattar, read out well over a 100 verses from the Kaisika Puraanam with Paraasara Badri Bhattar holding out the Puraanam papers for the entire stretch of 2 hours. It was a non stop recital in a loud and clear rendering of the songs. For a man who could barely walk, it was a truly memorable performance, to stand for two hours late into the night and reciting with great clarity the Kaisika Puraanam. He was sweating profusely but during these 2 hours (11.30pm-130am) he did not sip a single glass of water nor did he pause even for a moment. Such was his passion and commitment to the Kaisika Puraanam. So happy were the devotees at the end of the recital, that several hundreds of them fell on the Bhattar’s feet for his blessings. It had been 4 hours of captivating narration and enactment of Kaisika Puraanam. 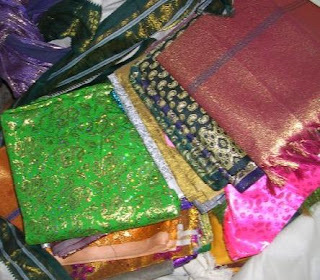 On the Kaisika Ekadesi day, Lord NamPerumal is given 365 dresses to make up for not giving him enough new dresses through out the year. At the end of the Bhattar recital of Kaisika Puraanam and after another change of dress, theertham (sacred water) is served. By now, it was almost 2am. After being allowed only a few hours rest after a long and tiring day/night, Lord NamPerumal is woken up quite early the next morning to be dressed up again. Starting sharp at 5.15am, NamPerumal is taken out on a procession back from the Arjuna Mandapam to his sanctum. Just before his entry into the Santanu Mandapam, the Lord is showered with camphor powder that spreads a special fragrance around Lord NamPerumal. This is in recognition of the special happy event the previous night and for the Lord having stayed up late into the night. The Telugu ruler Vijaya Ranga Sokka Nathan was eager to see witness the Kaisika Ekadesi Celebrations and especially the ‘Karpoora Padi Etra Sevai’ (showering of camphor powder). Unfortunately, he came late and the Lord had already entered the Santanu Mandapam. Having come from a great distance, the king requested the Lord to provide a replay as he could not go back without seeing the Kaisika Ekadesi Celebrations. However, the Lord refused to accept this request stating that he is always on time and does not wait for anyone. Lord NamPerumal asked the king to come on the same day next year. So upset was the king, who had come there all excited with his family, that he decided to stay put outside the NamPerumal Sannidhi for another year. 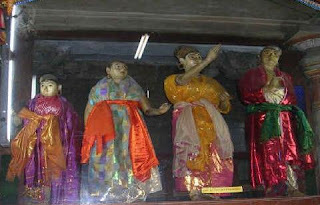 In memory of this event, the idol of King Vijaya Ranga Sokka Nathan along with his family can be seen outside the Perumal Sannidhi on the Western side. An interesting aspect that one noticed in the Kaisika Puraanam recital and the Araiyar Sevai is that it clearly brought out the fact that, in centuries gone by, music and dance had a special place in religious worship in Divya Desams. Also, as could be seen from Lord Ranganatha’s comments on TirupaanAzhvaar (http://prtraveller.blogspot.com/2007/09/108-divya-desams-srirangam-lord.html) and the Kaisika Puraanam episode at ThiruKurungkudi, the Lord did not differentiate between caste and class when it came to the purity of a devotee’s intent. one of ur blog admirer and this post made me happy..pictures are also captivating..
BTW, on karpoora-padi etra sevai perumal purappadu/moolavaridam return via right-side padikkata? or the usual left-side? The Purappaadu is through the usual Kannaadi Arai side -Western side(right side of sanctum, left side when devotees enter the prakaram) and the return is also on the saime side.